Visiting Cuba has been at the top of my bucket list for as long as I can remember. Maybe it’s because of what happened in 1962, when I was in first grade in Jacksonville, Florida. Like most other children in the United States, we had regular duck-and-cover drills after U.S. intelligence discovered Soviet missiles in Cuba. But because Cuba was our too-close-for-comfort neighbor, administrators in my school system went one step further. They took us on a field trip to the old Spanish fort at St. Augustine. “This is where we’ll come in the event of nuclear attack,” our principal announced as we spilled out of the school buses. “Yippee!! !” we said, too young and naive to bother asking what nuclear attack meant. “This will be fun!” Khrushchev blinked, of course, and we never had to hole up at the fort. Somehow, though, the mystique of Cuba was planted in my brain. Or maybe Desi Arnaz was the reason I wanted to go. I was too young to enjoy “I Love Lucy” when it first aired on TV (1951-1957), but I watched it over and over again when it went into reruns. Cuban bandleader Ricky Ricardo captured my heart with his swarthy good looks and his thick Spanish accent. If that’s what men were like in Cuba, I was ready to jump on a boat and sail off into the Caribbean Sea. I was in high school when airline hijackings to Cuba reached their peak. From 1968 through 1972, more than 130 U.S. flights were diverted to Havana. Fifty years later, the notion of an airplane passenger pulling out a gun and storming the cockpit seems almost quaint, though in truth the encounters were sometimes violent and almost never ended well. Fidel Castro whisked the perpetrators off to prison and demanded—and received—an average of $7,500 for the airlines to retrieve their planes. But perhaps my biggest reason for wanting to visit Cuba was that I wasn’t allowed to. This lush tropical island, the largest in the Caribbean and little more than a stone’s throw from Miami, was off-limits to everyday U.S. citizens like me. 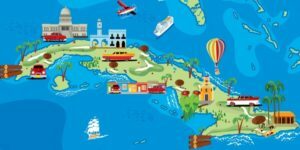 So when I recently learned of a trip that would begin and end in Jamaica but would allow me–via controlled shore excursions from a cruise ship–to visit three ports-of-call in Cuba, I jumped at the chance. For the next few weeks, these columns will focus on my incredible journey. Though the editors of this paper suggested I write a traditional travel story about the trip, I convinced them I couldn’t make that work. A travelogue just wasn’t personal enough. Because Cuba changed me. The beauty. The poverty. The troubled history. The majestic buildings, many of them crumbling. San Juan Hill. Banos. Old cars. Rum and cigars. Schoolchildren. Beggars. Hustlers. Dogs and horses. The cult of Fidel and Che. I only hope I can do it justice.